Rome wasn’t built in a day but if a day is all you have, we have created this full day itinerary so that you may experience the highlights of the Eternal City. 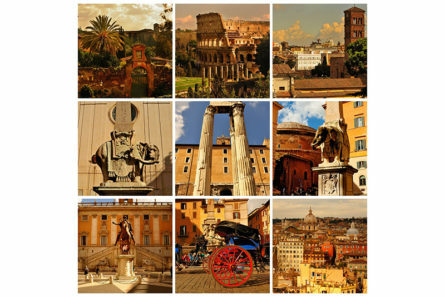 Join your private English-speaking guide from Italy’s Best on our “Highlights of Rome” tour. Your driver and guide will pick you up and bring you to Aventino, one of Rome’s seven hills, for an introduction to the city and a sweeping view of its distinct domes and sprawling sites. Following a stop at the iconic Circus Maximus, Rome’s first and largest sports arena dating all the way back to 326 B.C. and hosted chariot races and athletic contests. The circus still holds its original oblong shape and is now a public park. Next, visit Campidoglio, or the Capitoline Hill, the most important of Rome’s seven hills. During the days of the Republic, Rome’s first capital was located atop this hill and it’s where many of the government offices are located today. At the top sits a magnificent square designed by Renaissance great Michelangelo. The terrace overlooking the Forum offers a look at Via Sacra, Ancient Rome’s main thoroughfare, as well as ruins from the numerous temples and basilicas that stood tall during ancient times. Passing through Piazza Venezia we will see the extravagant Victor Emanuel Monument, a commemoration to the 1870 unification of Italy. Continuing along Via dei Fori Imperiali – built during the Fascist Period, and flanked by the ruins of the Imperial Fora we will head towards the Colosseum. Skip the lines to enter the architectural masterpiece and reminisce on thousands of Romans gathering to watch cruel fights between gladiators and wild animals. After a lunch break, for which your guide will provide you with some local recommendations, reconvene on Via dei Fori Imperiali for a closer look at the Roman Forum where you will get a picturesque view of the largest open-air museum in the world,and Palatine Hill where many of the Roman emperors resided. Next on the agenda are the lively Spanish Steps followed by the charming Baroque treasures of the Piazza Navona. Your guide will then lead you to the Pantheon, one of the world’s best-preserved ancient buildings where you can see how Romans perfected the use of arches to sustain their enormous architecture. Your tour will conclude at the iconic Trevi Fountain so you can toss a coin over your left shoulder into the marble basin; a tradition ensuring one’s return to the Eternal City.